City Within the City acknowledges cities and urban areas as a prevalent way of life for a large portion of the world’s population today. Approaching cities not as mere statistical entities, this exhibition examines the issues that arise from regarding them as agglomerations of people established over time. As such, they can be experienced as sites of reciprocal action between built environments — historically, geographically and administratively determined — where human subjectivities appear in constant physical, psychological and intellectual reconfiguration. 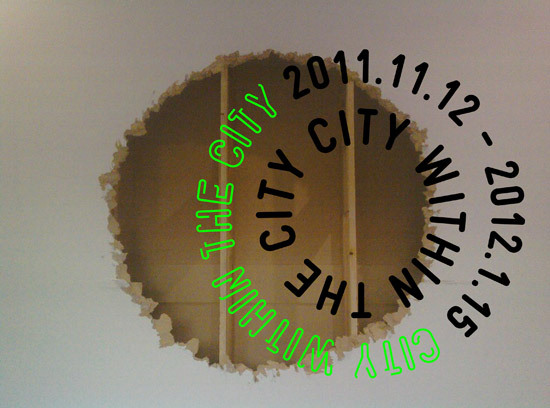 This first version of City Within the City presented at Artsonje Center, reflects Seoul’s urban structure. The dynamic metropolis Seoul has become bears traces from the impact of industrialization, the devastation of the Korean War, reconstruction under postwar and Cold War regimes, and its emergence as a world presence due to economic growth. These complex factors influence the dynamics specific to the commercial and industrialized zones of Seoul. Increasingly contained within these governmentally and politically demarcated areas, what possibilities for creativity, transgression and resistance exist for the human body, imagination and memory? City Within the City charts the remembered, fictional, expected and resisted cities as they are publicly and privately negotiated by the individual. Questioning the consequences of and presenting alternatives to formal governmental configurations of city development, several works in the exhibition provide resources and open platforms to reconsider urban spaces as increasingly active sites for creative investigation and transgression. The works featuring in City Within the City adopt parallel and tangential ways to address different points of friction, misalignments, and moments open to re-imagining existing circumstances. Through this process, the exhibition offers itself as a site for widening the possibilities for engagement with the cities within our cities. City Within the City @ Gertrude Contemporary, Melbourne :: August 17-September 22, 2012 :: 200 Gertrude Street, Fitzroy VIC 3065 Australia.